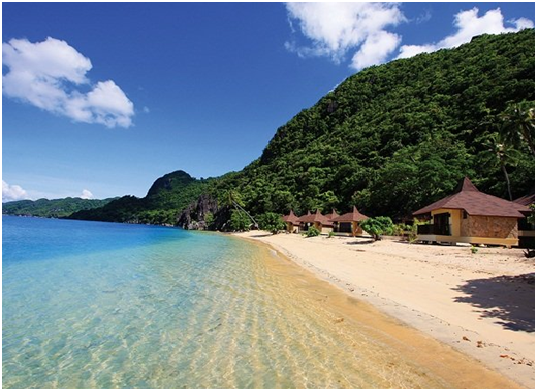 Come and explore the exotic beauty of Caramoan! The island is a municipality located at the province of Camarines Sur in Luzon, the Philippines and is composed of 49 barangays. A second class municipality, Caramoan has a land area of 277 square kilometers including 71 kilometers of irregular coastline surrounded by the Pacific Ocean, seas, a bay and a swamp as well. It is about 500 kilometers from the Philippine capital of Manila and 110 kilometers east of Naga City, the capital city of Camarines Sur and the heart of the Bicol Region. The island paradise is isolated from the rest of Camarines Sur that is why it is considered a secret paradise still unexploited for big time tourism. However, the place is rapidly being known and is beginning to be a top Philippine tourist destination. Its beauty is a splendor to enjoy and gives island hopping a different meaning. Caramoan can be reached from Manila through the Southern Luzon expressway leading to the central business district in Naga City. Flights are also available regularly from Manila and to Pili Airport through carriers like Air Philippines and Cebu Pacific. You can ask the people in the Camsur Tourism Office to organize your transport transfers. Those who love to use the kayak, snorkel and scuba dive will surely enjoy the place and will experience really great ocean adventures due to the presence of diverse marine life and hidden enigmatic lagoons. Rock climbing through the limestone cliffs is one experience you wouldn’t miss while also exploring the caves. You can also enjoy star gazing at night. A top end resort of the island beach and considered luxurious is the Gota Beach resort which was used by the crew of the popular reality adventure series “Survivor” Season 25 and 26 as a base. The Gota Resort is surrounded by very high limestone cliffs aggressively covered by vegetation, and also includes two coves boasting of fine sand and serving as a jump off point for island hopping. A middle class accommodation called the Bed and Dine is a pension house located in the town proper at the main road in Barangay Tawog. Bed and Dine is also a trusted restaurant where many island visitors come for breakfast lunch and dinner. The La Casa Roa Hostel boasts of clean and spacious rooms with a wide terrace and is considered the most expensive place to stay in the town proper.